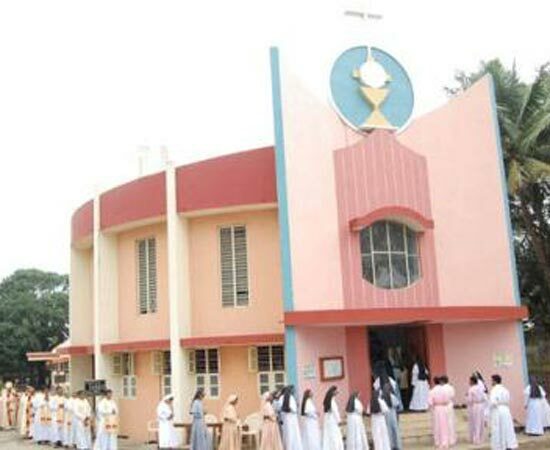 Catholic Diocese of Bhadravathi in Karnataka, India was erected on 21st August 2007 by the Synodal decision of the Syro-Malabar Church with the approval of the Holy Father Pope Benedict XVI, bifurcating the Diocese of Mananthavady, Kerala. The territory of the Diocese of Bhadravathi comprises the civil district of Shimoga in Karnataka State. A major part of Shimoga lies in the Malnad (hill land) region of the Western Ghats, a region known for its green forests, plentiful rainfall, beautiful waterfalls, and source of many rivers that flow in Karnataka. The history of the new diocese should be traced back to the migration of a group of Syro-Malabar Catholics from Kerala to Karnataka immediately after the World War II in search of land and they found Shimoga and the surrounding districts very conducive to their agricultural practices. They slowly tried to settle down as small groups in different parts of Shimoga. These migrant families were under the pastoral care of the Diocese of Mananthavady in Kerala. Due to the geographical distance from the diocesan centre and the cultural and linguistic differences it was almost impossible for the diocesan authorities to take care of the pastoral needs of the migrants. Hence Mar Jacob Thoomkuzhy, then bishop of Mananthavady entrusted the Missionary Congregation of the Blessed Sacrament to take care of the spiritual and pastoral needs of these people. The dedicated work of the MCBS Fathers for the past 30 years paved the way to the creation of the new Diocese of Bhadravathi. The first bishop of the diocese Mar Joseph Arumachadath was consecrated and the new diocese was inaugurated on 25th October 2007.